I love this one!! 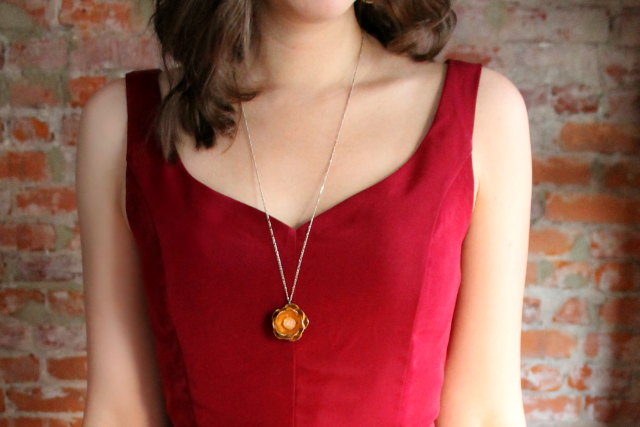 Wrapping up my series of holiday dress inspiration, 7 Days of Holiday Party Dresses, and I'm super excited about this incredible dress by Andrea of Four Square Walls. Seriously gorgeous! Here's Andrea! The holiday season is a bit overwhelming for seamstresses, isn't it? Since I can sew, I often feel that I should sew every gift. As well as make all my holiday decor by hand, and embroider some stockings, and oh yeah, sew a holiday party dress. For me, the dress is the most (...only?) exciting part. This is a pretty conventional holiday dress, so I'm glad the other ladies in this series delivered a variety of colors, shapes and styles before me. My dress ticks all the ole predictable boxes. Red. Slightly shiny. Worn with a bow on it like a little present. Mrs. Claus would approve, and I do, too. I haven't owned anything like this in forever, if ever, so I think it fills the void in my wardrobe for a red, slightly shiny dress with a bow on it. Doesn't every woman need one? When I was thinking of what to sew, I wanted something simple but relatively fancy. I sometimes browse Modcloth for dress inspiration, but their collection is so vast that you can spend weeks scrolling through their solid color fit-and-flares until your eyes cave in. I did come across their Ladylike Luster dress early on in my search and was drawn to the neckline and circle skirt. I immediately recalled the Minnie Mouse dress that Neeno of Sew Me Love made for a costume party awhile ago (found here). I decided to go in a similar direction, so I bought the pattern she used -- New Look 6723 -- and, like she did, swapped out the gathered skirt for a circle skirt. Let's hope Neeno doesn't mind copy cats. 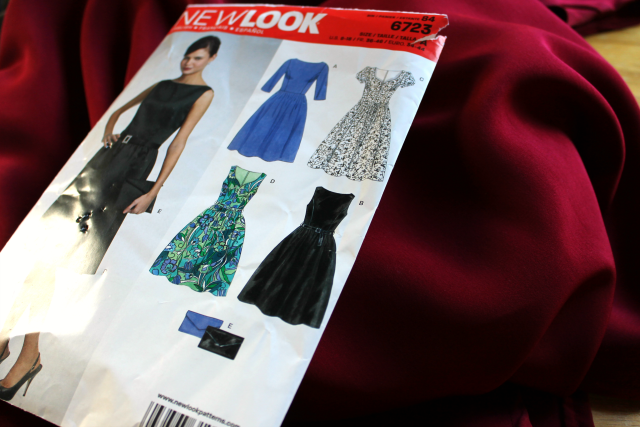 The fabric is a drapey poly crepe, which I love sewing, love wearing, but hate pressing. 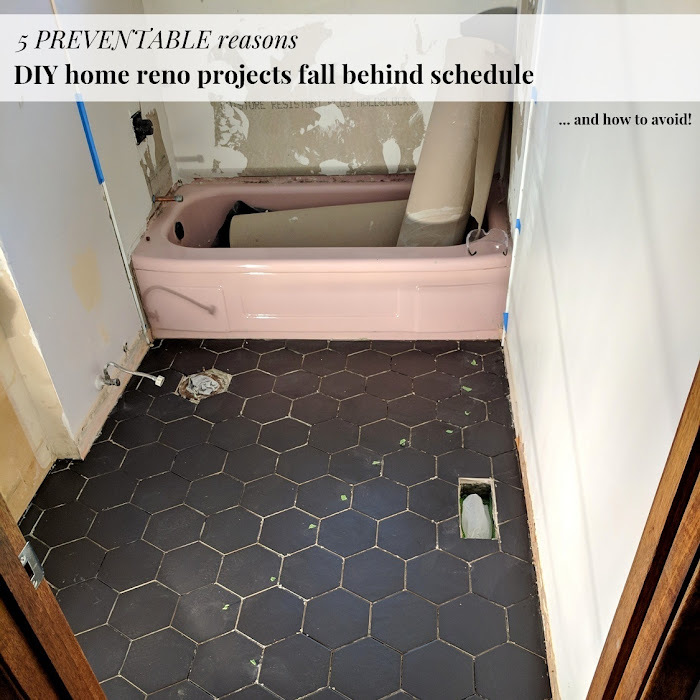 It can get wicked shine and seam indentations if you're not careful. Speaking of not being careful, I actually first made this dress in a royal blue crepe (first pictured in Suzannah's teaser post for this series), but I, uh, accidentally sliced out a sizable chunk of fabric from the back of the bodice after the whole thing had been constructed. Watch those rotary cutters, people! 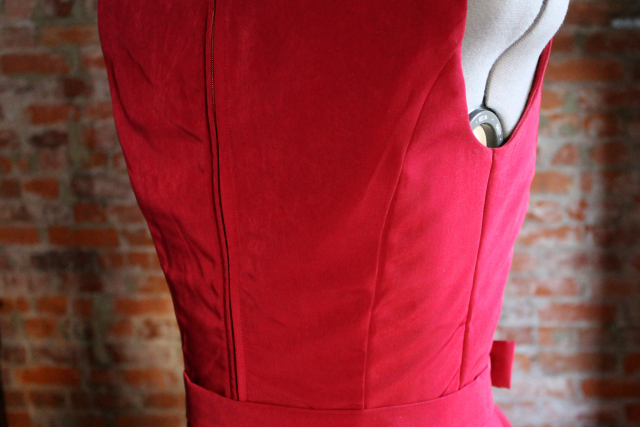 So I was incredibly lucky when I was offered some cranberry red crepe in the same weight and drape as the original. I helped a woman with a sewing gig last week, and she let me shop her stash! I feel much better about this color anyway, and sewed the dress quickly, having done it already. Oops, half-ironed. The construction of this dress was fairly straightforward. The bodice is fully lined -- I just used self-fabric to line mine so the colors would be exact. For those interested in this pattern, I'd definitely recommend following the instructions and fusing interfacing to the lining side of the neckline to help keep its shape, and understitch as much as possible to keep the seam line out of sight on all edges. I also cut my lining slightly smaller along the neckline and armhole curves so it wouldn't be tempted to puff out as much. What's not included in this pattern is the bow belt, which I made after being inspired by Tilly's tutorial. I should have followed her dimensions exactly, but I was in a rush making this one and thought I could wing it. It's not my dream bow belt, but I still think the effect is cute enough. I interfaced the bow so it would stand straight. OMG, Andrea, so fabulous! 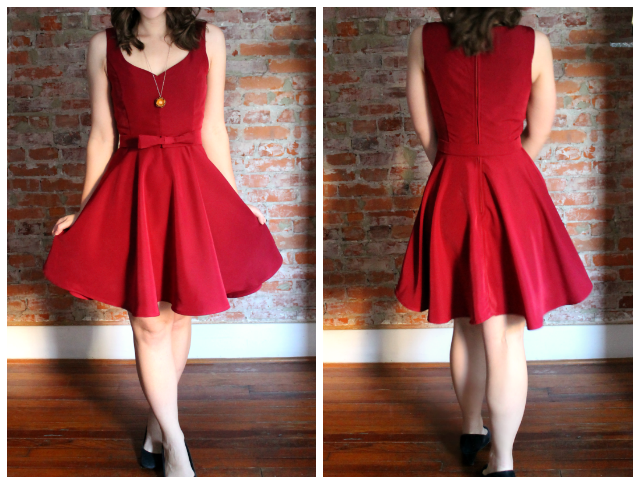 The swingy skirt, the bow belt, the great deep red color... the perfect holiday party dress! And a great one to wrap up the series! 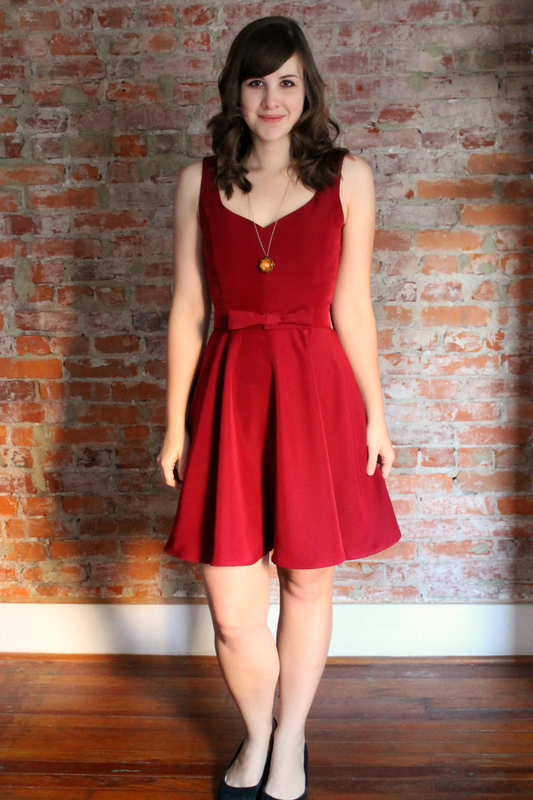 Hope you all are super inspired now, after 7 great holiday party dress posts the past couple weeks!! Here's to sewing on the long holiday weekend! Let the holiday season begin!! Gorgeous!! And as always, Andrea, you're hilarious! this is so sweet! i love it. you will be the bell of the ball! i also love this pattern and neckline. ive had it on the sewing list for at least a year. I LOVE this dress! I need a red one for the holidays. Its perfect! so perfect, i love the circle skirt with that bodice! and ohmygosh i can't believe you had to completely remake the dress... i would be livid for days had i accidentally chopped up a completed dress. hope you can at least salvage a skirt out of it! I think I'll probably try to get away with wearing the dress with a blazer and pretend the hole isn't there! Adorable. It's like a grown up version of a little girl's Christmas dress. The dress looks gorgeous. I need to revisit this pattern cos I love the neckline!! Need to do an SBA though! Really pretty!! I'm sad to hear about the rotary cutter accident. :/ With great power, comes great responsibility... Beautiful result.